All Seasons Tree - Arlene is in her glitter phase. And I do mean glitter! 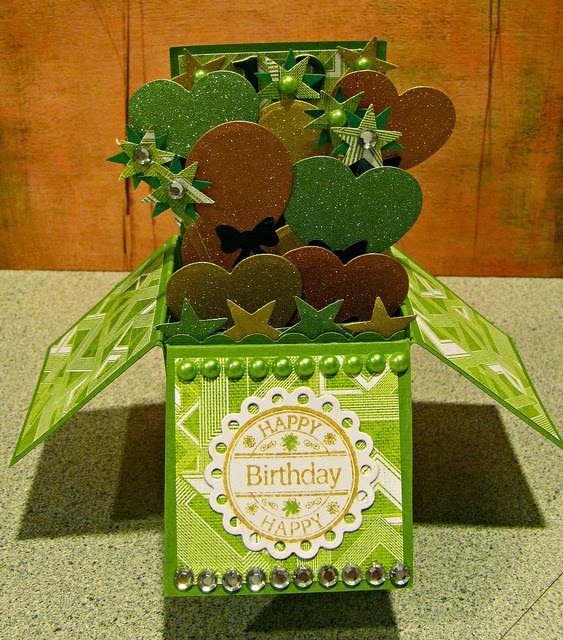 I just love the two leafy die-cuts. They will be great for clouds too. thanks Cathie for such inspiration. 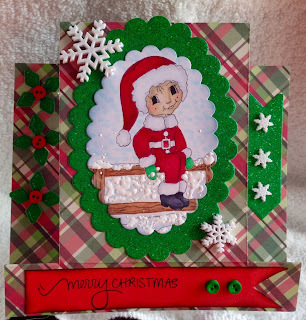 Elizabeth Craft Design Accordion Oval Card Dies, Penny Black background stamp Mystic Connections, Heidi Grace Wedding Stamps, Mark's Finest Papers sentiment stamps, Versafine Black Onyx ink, Red colored pencil, Glossy Accents, Platinum Stickles. Thank you Michelle for providing some stunning samples using Elizabeth Craft Design products. 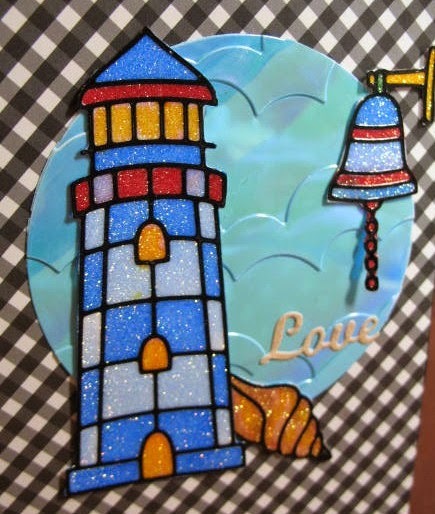 Arlene had a great time coloring the lighthouse, shell and nautical bell with Copics right over the Silk Microfine Glitter. 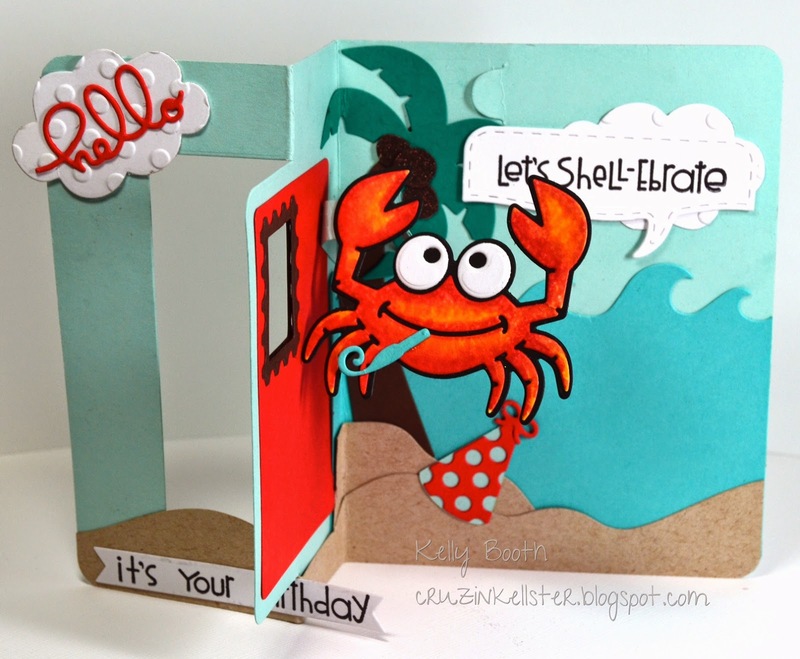 She thought of checkered table clothes in little seaside restaurants and looking out at a blue sky and lighthouse when creating this card. To see close-ups, visit A Bit of This and That. By omitting the Christmas lights... Marsha has made a lovely little house scene. Arlene's granddaughter is now the proud owner of this card. 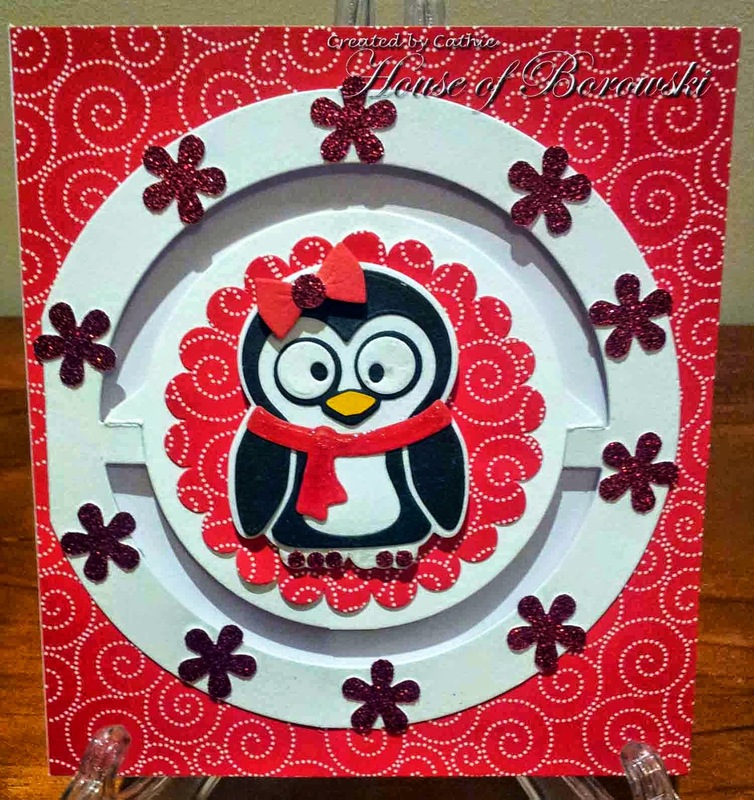 Couture Creations Scalloped Circles Nesting Dies, Gloss Accents and Gems to sparkle her up with. Spellbinders Nestabilities Standard Circles Small. Thanks Cathie for these delightful cards. Thought I'd share a few more of Kelly's beautiful work. Thanks Kelly for being our fabulous guest this month. Introducing this month's guest..... Kelly Booth. We are very excited to have the extra-ordinarily talented Kelly Booth. Kelly designs for Elizabeth Craft Designs. So Divas, let's get us to know Kelly. I Live in Arizona with my husband and our 15 year old dog Xenia. I have two grown daughters and three adorable grand children that I adore. When I'm not paper crafting I love to cook and be outdoors. I started stamping in 1986 and bought my first stamp at Knott's Berry Farm in California. I'm not one to follow sketches I just jump right in after getting an idea in my head! I usually make 4 projects a week sometimes more. What is your favorite tool (what can't you create without) & why? I would have to say my favorite tool are my copic markers since I use them on almost all projects. 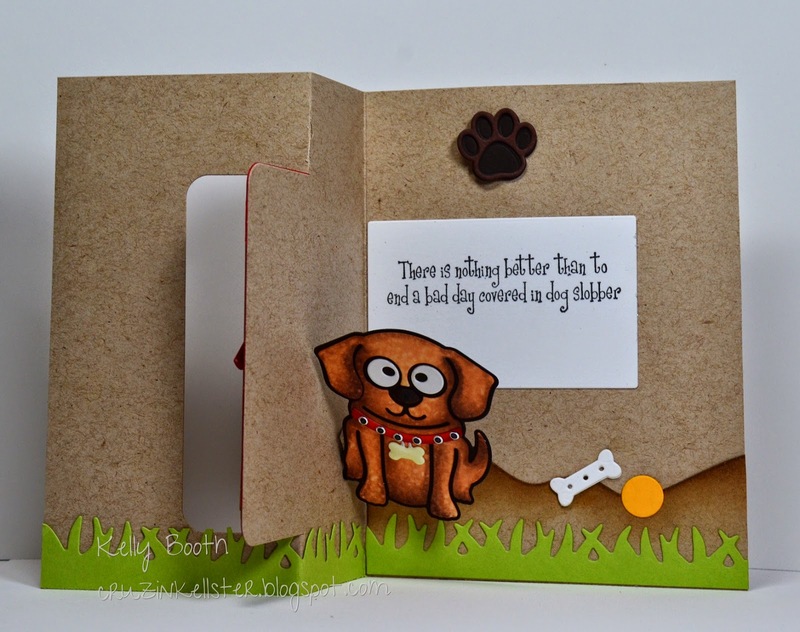 Definitely die cutting I'm addicted to dies! I'm not really sure I have a style? 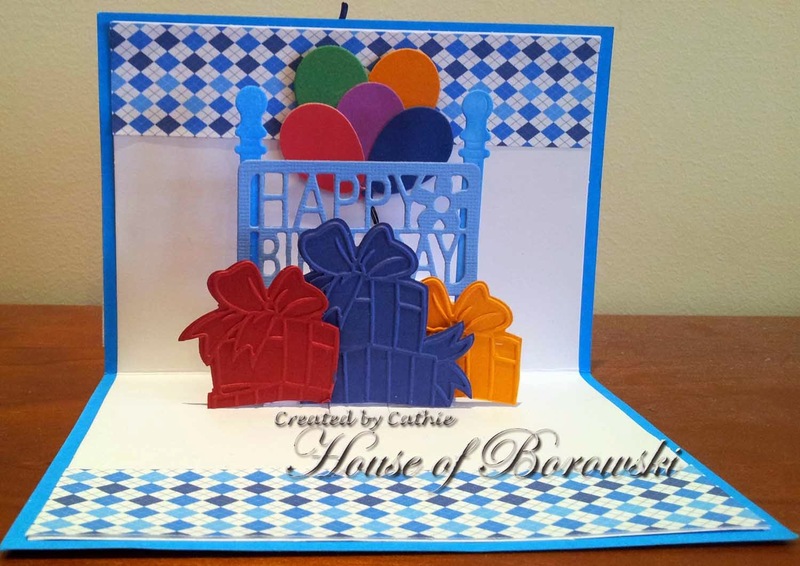 I Love color and usually include bold colors on my creations. I wish I could do clean and simple, I tend to put too much into my cards. 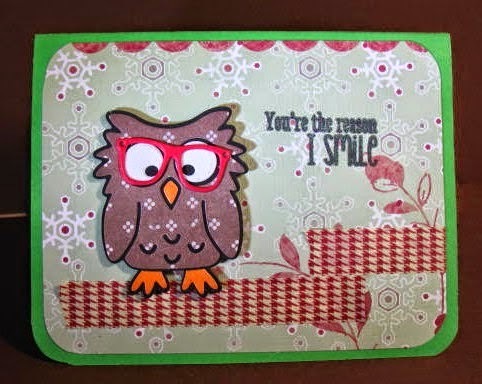 I'm currently on the Karen Burniston Design Team and Purple Onion Designs. I was on the Elizabeth Craft Design Team last year. 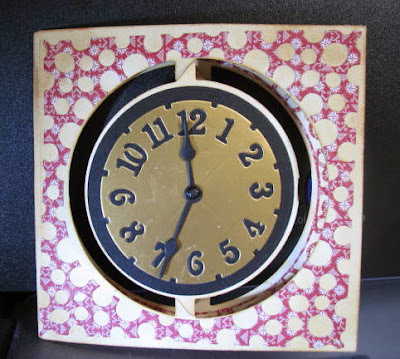 I submitted one time to Paper Crafts and was published and years ago once in Paper Crafter. One word MESS!!! 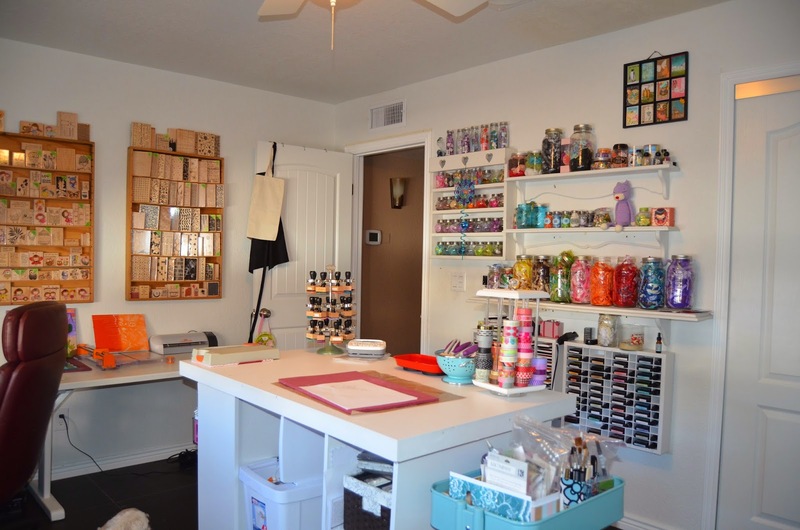 It's a small room that needs organized in the worst way, i just have too much stuff! Thanks heaps Kelly for sharing with us. 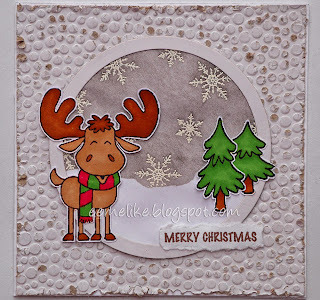 Here I am today to sharing another card using Elizabeth Craft Design Peel Offs. Arlene kindly added some ultra fine glitter to the peel off and I then coloured with Copics and cut out. I embossed the background and added the ducky. The sentiments are from a Fiskars set. 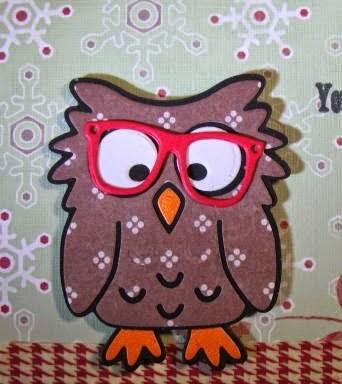 Do hop over to Elizabeth Craft Designs to see the peel offs that are available. 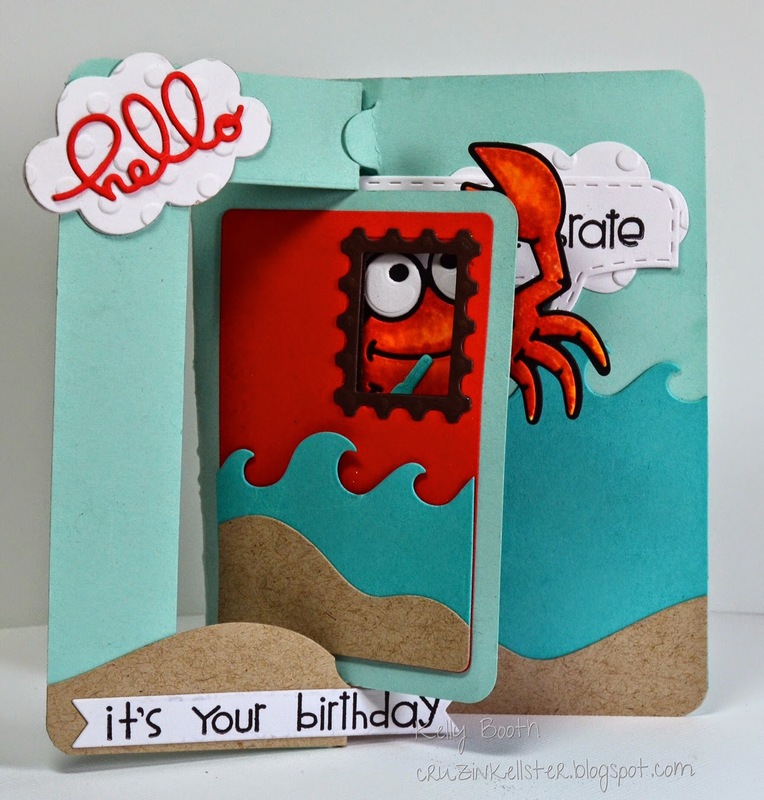 Today I am sharing a couple of little Penguin cards. The little penguin can be found here. 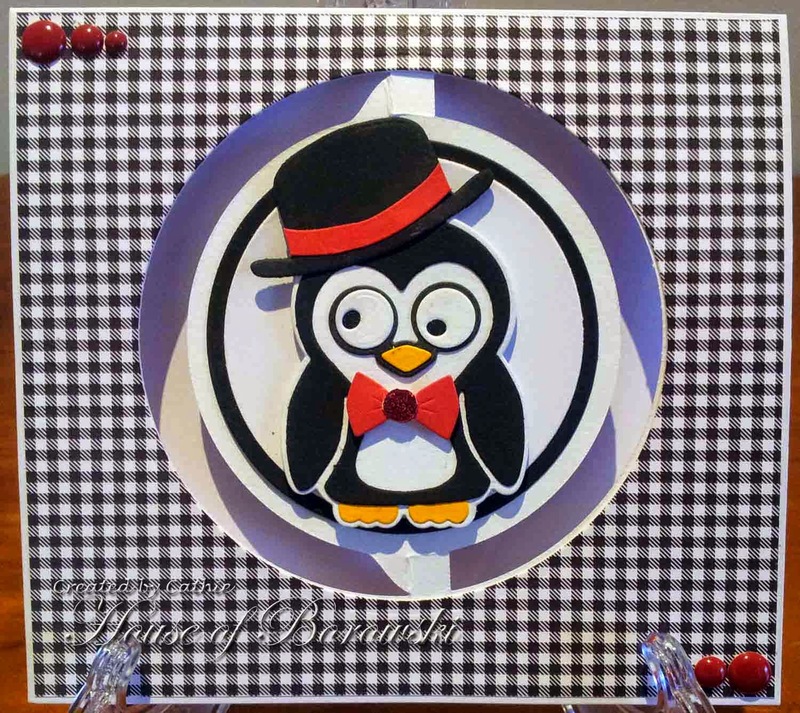 Michelle used the same little penguin die together with Lawn Fawn Hillside Stitched Dies, Darice snowflake embossing folder and some Wink of Stella clear. Thank you ladies for sharing this cutie with us. If you've never used these peel-offs, you'll be pleasantly surprised with the variety of peel-offs and what you can do with them. I didn't know what I was missing until I took a class from Elizabeth herself. Now peel-offs and the silk microfine glitter are a MUST. Elizabeth (Els) taught a class at my local stamp shop and she is a fun teacher and patient (YEAH). You should park your chair on Youtube to watch her videos too. 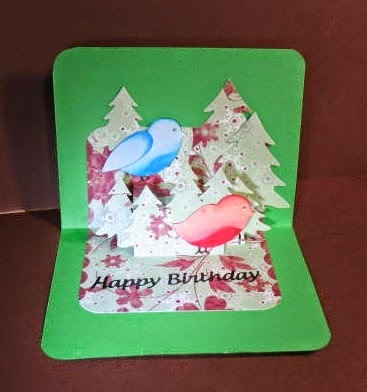 Here is a card I made with the peel-offs and a step-by-step tutorial that I made using Silk Microfine Glitter and Peel-offs. I think Elizabeth does a fantastic job of showing you how to use the double-sided adhesive, peel-offs and glitter here. 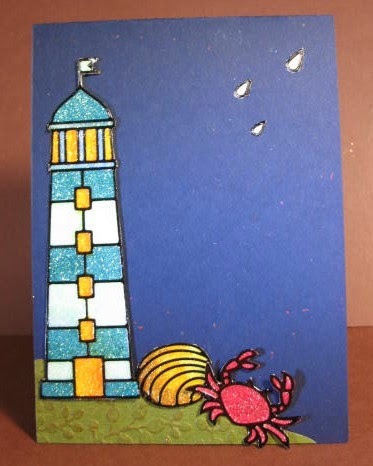 I only used the raindrops on the outside of this card, but I had already cut and colored the marvellous lighthouse, shell and crab. I wanted to show you how easy this is to do. 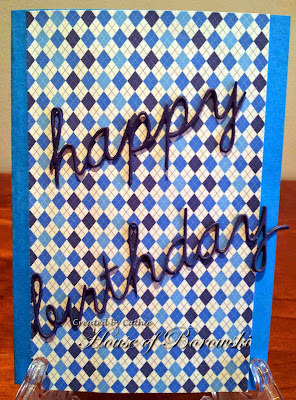 I cut the Elizabeth Craft Designs Transparent Double-sided adhesive (6: X 6") down to a size I wanted to handle (below). See how you can peel the adhesive easily. 1. Peel off the sticky side and put out of the way so you don't get anything stuck to it. The sticky white strip below is just to show you the two pieces taken apart. I wouldn't leave it there at all. 2. Pick up the outline of the piece(s) you want to use and place them on the non-stick side as seen below. You can use your fingers or a tweezer to pick them up. It is easier to move the peel offs with a tweezer once on your non-stick sheet. As you can see, the white spots in the black peel off sheet are where I picked up the outlines. 3. Place the sticky sheet onto the non-stick sheet which is on the table. Run your fingers over the top so everything is smooth and all transferred. I couldn't hold my camera and put the sticky sheet on the non-stick sheet with the peel offs, so I'm showing you what it looks like after you have done that. 4. Peel off the sticky sheet. 5. Hold the sticky sheet by the sides so your hand and fingers do not touch the sticky side. I just turn the container onto the sticky side and let it run down half the sheet onto a coffee filter. 6. Now you can clasp the other side which is glittered and pour the glitter onto the rest of the sticky surface. See below. 7. Tap any remaining glitter onto the filter which is easy to fold and pour back into the container. 8. 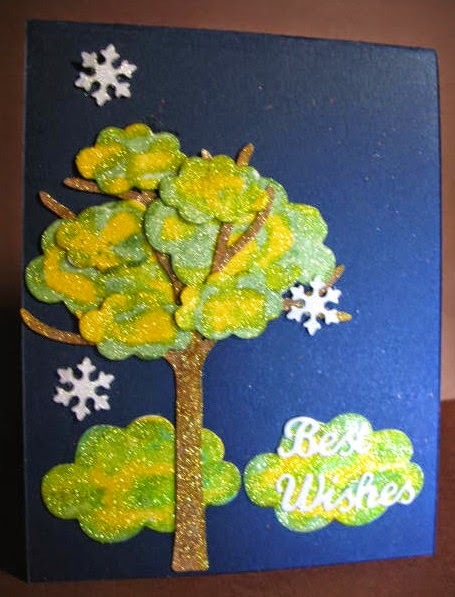 Burnish glittered panel with your finger.. (Rub the glitter into the adhesive, but not with a heavy hand). 9. Take a brush and brush any glitter that may cling (which is not much) off onto the filter. 10. Cut the peel offs and use as is or color. I used Copic markers, but any alcohol marker will do. I used the angled tip, not the brush tip to paint. These are all cut from the strip I used above. The glitter really lasts a long time. The winner of the December challenge is # 12. Please contact Hannah through the Die Cut Divas' email at thedcdivas@gmail.com for information on how to retrieve your prize. Isn't this just adorable. SO CUTE! Happy January 1st - NEW YEAR, NEW DAY! I just love the fence that opens up to the skating, just like the skate park in Lithia Park. 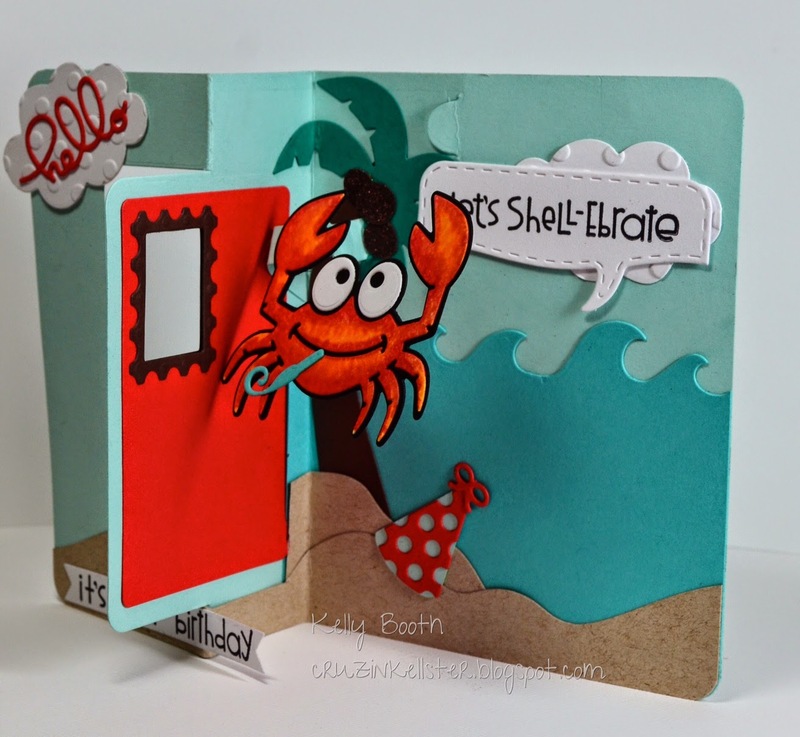 Great coloring skills, and lovely die cuts were used. So hard to pick just one! I just couldn't go past this gorgeous little fairy and the blue and white colour scheme. It was just perfect. Happy January 2, 2015.when we publish our picks and random drawn winner. 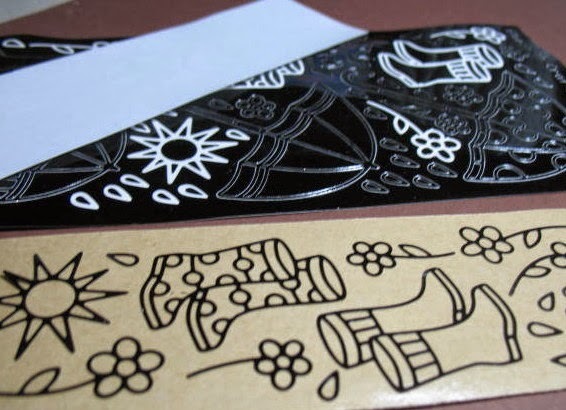 If you haven't seen the beautiful dies,embossing folders, peel off stickers, microfine glitter... then do hope over to their website and have a look around... I can guarantee you will enthralled. 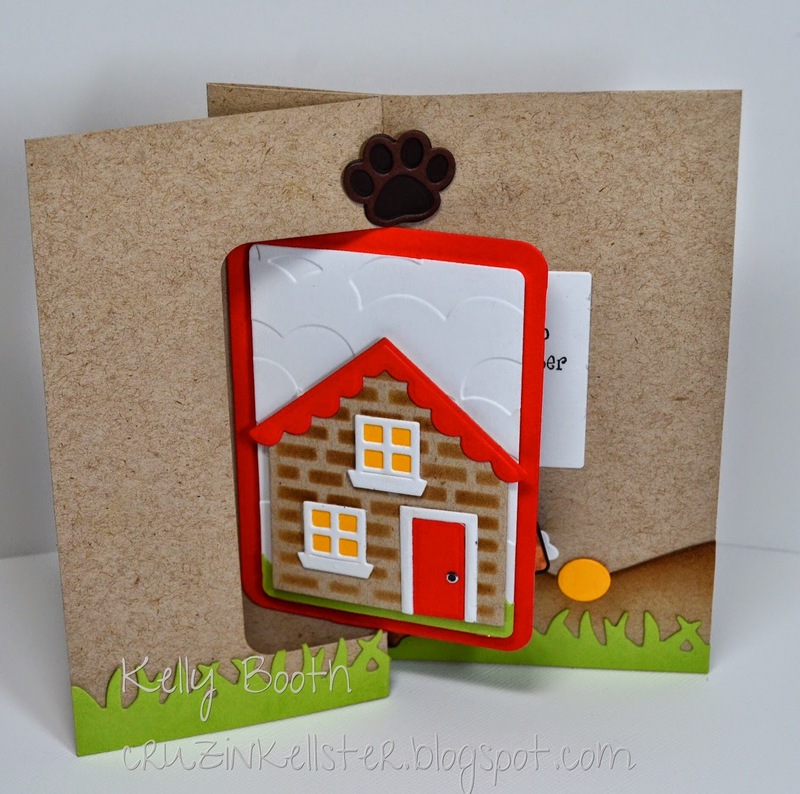 The team has been working with some of the Elizabeth Craft Design products.. 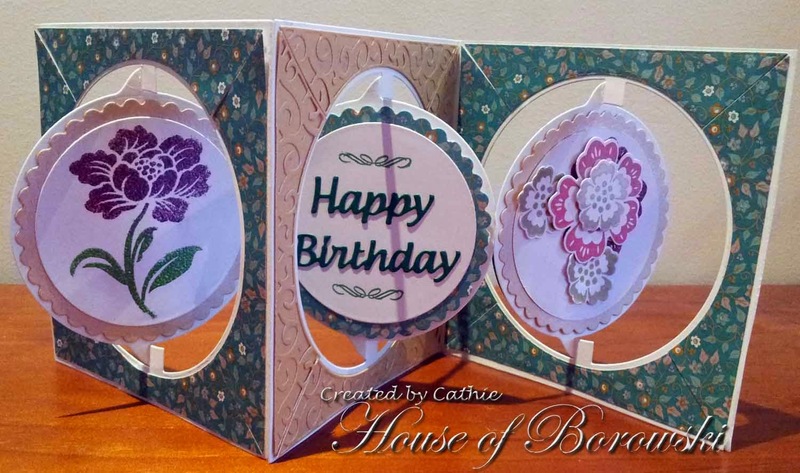 Using Accordion Circle Die, Square with Circle Frame Edges, Elizabeth Crafts Happy Birthday, Spellbinders Nestabilities Classic Circle and Scalloped Circles, Flowers are a Sizzix and Hero Arts Stamp and Die Set.